Life does not often provide the opportunity to look back and reflect on things that have gone by, more often than not we are forced into the continual forward thrust of daily life, always preparing for tomorrow. Sitting in the kitchen on a sunny Sunday afternoon I find myself in the unusual position of being alone to dawdle with my thoughts, linger over coffee. After the final visitor has left for the weekend a silence falls over the house the likes of which this household has never before seen. No children preparing for school tomorrow morning, no washing machine whirring away in a last ditch attempt to get the uniforms ready and no rush to make Sunday lunch. Instead, it is just me, turning the lights out and sitting down with a drink. The last week of the Easter holidays has, this year, been one of the busiest weeks that I have had in a long while and as I sit down at the kitchen table, also the BasementHQ office desk, I try to focus my tired and blurring eyes on the job of putting into words an account of what has occurred over the last five days. 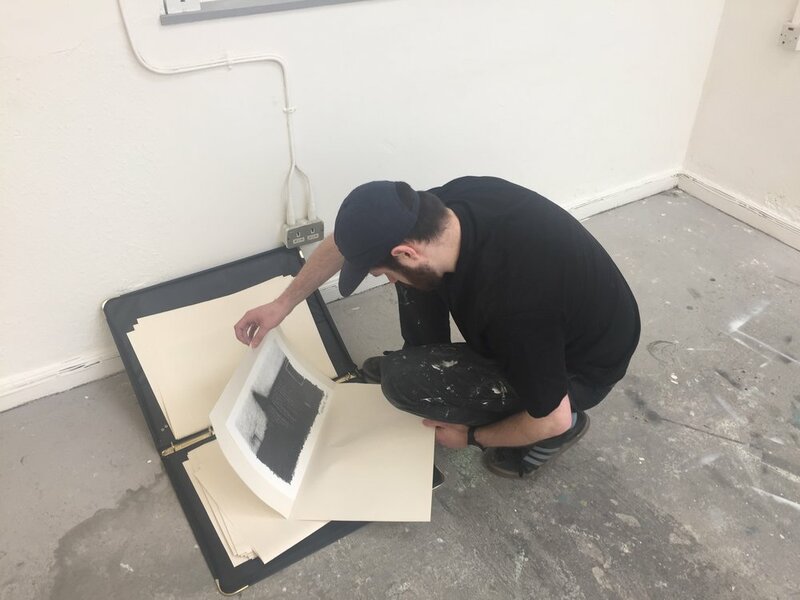 Monday morning saw the beginning of two installations and one de-install that would end later in the week with two new exhibition previews, one in Manchester on Thursday night and the other in Leeds on Friday night, followed by a weekend of keeping them open to the public. 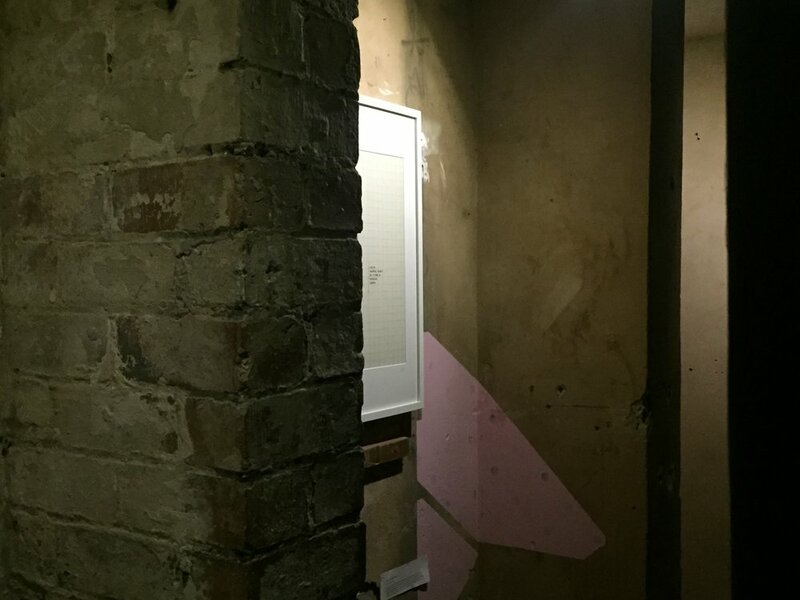 It is always a sad moment taking down an exhibition at BasementArtsProject, as over the course of the month, having lived with it, explained it etcetera, it is very easy to get attached to exhibitions, in this case Sohail Khan’s The Way You Are Is The Way You Are (The Soft Rains of England). Khan’s exhibition was quite an unusual one in as much as most people know Khan’s work as a performer, but most were unaware of the large amount of visual art that he has amassed over the last twenty-five years or so: sculptures, paintings and assemblages, all of which have over the years been used as objects for performance but here presented together for the first time in an exhibition format. This idea does follow a particular theme that has emerged here over the last year as with Naomi Gilby’s Now We Have Met, a cradle to the grave exposition for a single performance object, documenting it’s history of use from beginning to end. 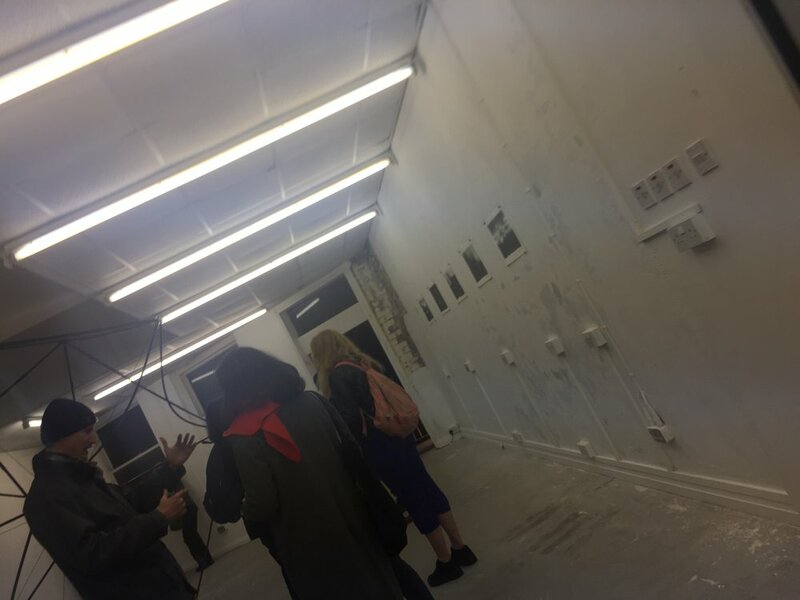 With performance featuring quite significantly in the yearly calendar here at BasementArtsProject I am sure that these ideas will be extended further in the future. 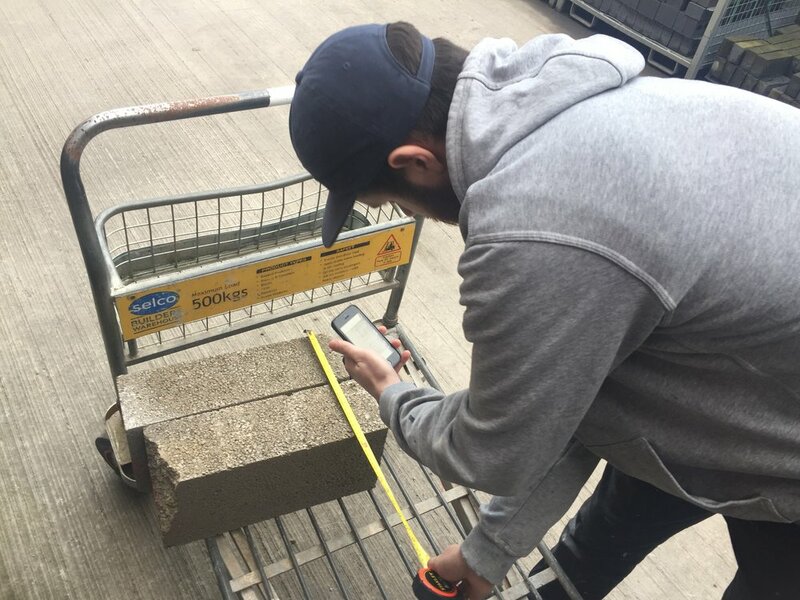 Having dismantled Khan’s worked and packed it away, Tuesday morning saw the beginning of an epic wall building session that would ultimately have to be ready for Friday lunchtime. Having begun to assemble the wall that morning, I have to break off at midday and head to Manchester with artist Adam Glatherine to assist with the installation of his, and five other artists, work at Depot Art Studios in Manchester. The next two days would be spent flitting back and forth between Leeds and Manchester working on the install of A City of Two Tales; part one of a collaborative exhibition in which BasementArtsProject selected five Leeds artists, whose work would then be curated by Depot Art Studios in Manchester. 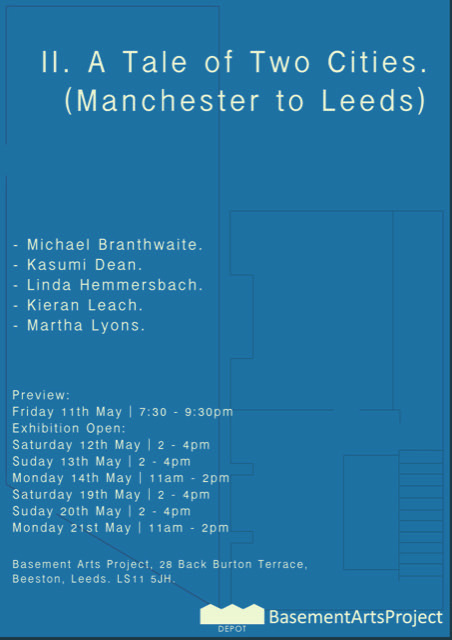 In May BasementArtsProject will stage an exhibition here in Leeds of five Manchester artists selected by Depot. As with most installations that I have worked on over the last decade or so the days begin early and end late, in this case with the commute back to Leeds. Depot Art Studios is a large white walled warehouse space on the edge of the city of Manchester that is home to four artists; Rowan Eastwood, Jack Ginno, Sam Potter and Alistair Woods, and for the next two weeks they have emptied out what is effectively their studio space for the purpose of this group show. Over the course of Tuesday, Wednesday and Thursday, Woods, myself and two of the artists install the work by Paul Digby, Alan Dunn & Martyn Rainford (with additional material by Jack Wolff and Laure Ferraris), Pippa Eason, Adam Glatherine and Ryan Riddington, with the last work going in just fifteen minutes before the beginning of the preview. 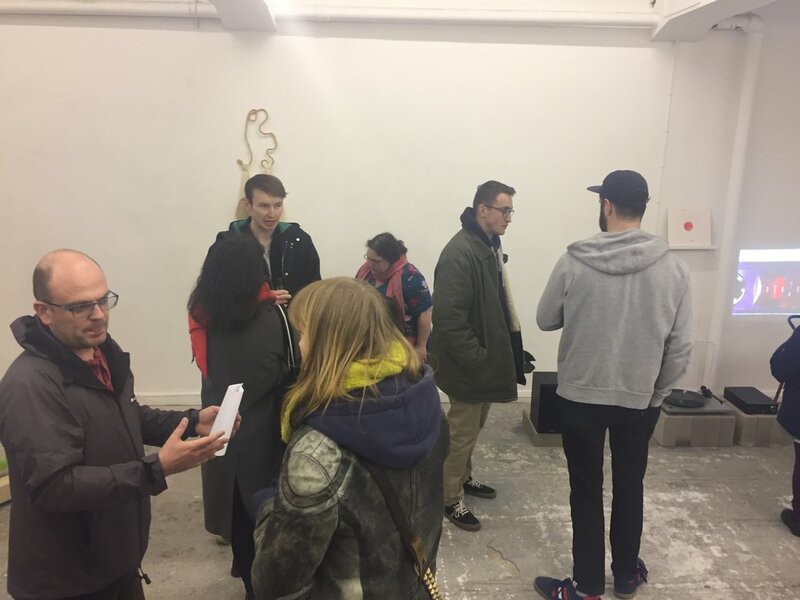 What followed was a lovely introduction to the Manchester art scene, meeting four of the five artists who will be joining us here in Leeds next month and many others, including people from PS Mirabel, Paper Gallery and The Whitworth. 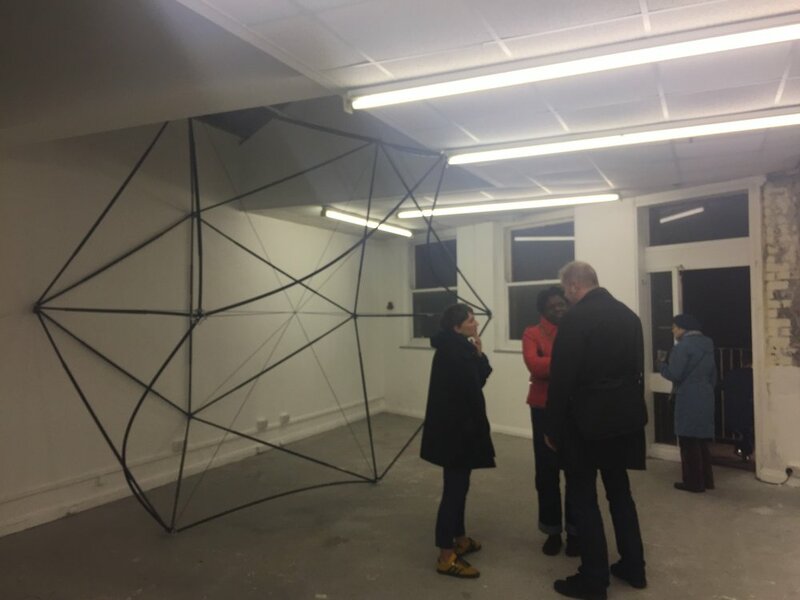 It was also good to catch up with some old friends such as Chris Daniels who made the journey to Leeds the next day and visited the new BasementArtsProject exhibition. Daniels is a previous exhibitor at the Basement having run one of his superb Unravel: the longest hand painted film in Great Britain workshops in May 2011, back at the beginning of our time as an arts project. After one final late night journey back down the motorway I am home and preparing to finish the wall at BasementArtsProject, ahead of Sheffield artist Sharon Mossbeck moving her work in the next afternoon. 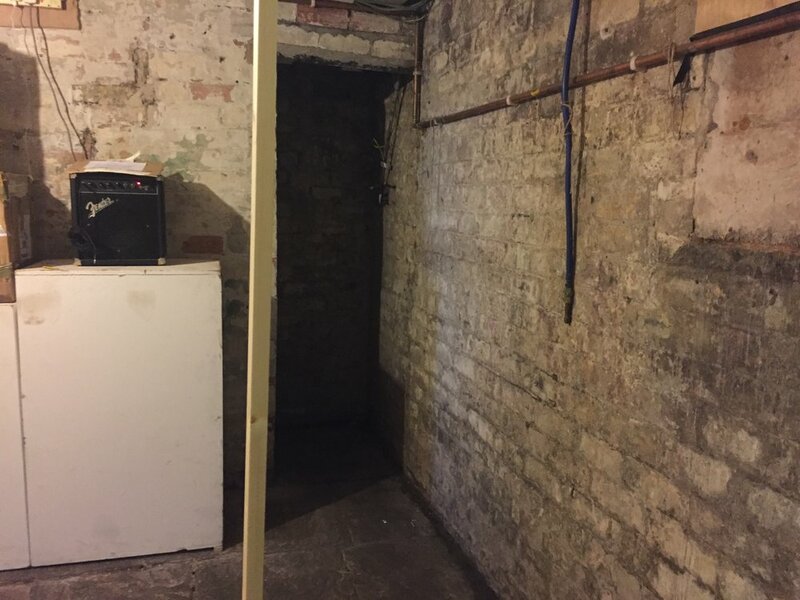 The whole of the next day is spent preparing the space and making the basement something akin to a dungeon atmosphere, to suit the work for Forgotten Spaces. Discussing Mossbeck’s work as we prepare to hang it later on Friday afternoon the tortuous nature of these medieval spaces becomes truly apparent, not just through the depictions in this series of cross stitch works, but also through the nature of their production. The aida used to create the works have been stitched to look like graph paper, each individual line, horizontal and vertical, apparently taking about twenty-five minutes even before any image is begun. Each of the five works has an average of two to three months work involved in them. Once they are hung in the basement, illuminated by single spotlights and squeezed into narrow passageways with low ceilings, the doom filled and harrowing nature of the pieces is writ large in the somewhat claustrophobic environment. In a little bit of research of my own about some of these spaces I discover that people actually elected to go voluntarily into such spaces as a form of penance. This leads me to think of the nature of cross stitch and the pain of making a work in a manner that could be produced quicker and easier by mechanical means. Cross stitch no longer seems a fun medium associated with twee imagery, but instead a way of punishing oneself for some un-communicated, un-specified misdeed. On the opening night everybody is forced to process in a u shape around the basement into a blackened void beneath the stairs to view the work, an act that has a number of people comment on how unsettling the overall environment was, a subterranean riposte to the light and airy space that was Thursday night at Depot. At the end of this very long week it feels like a lot of energy has gone into taking elements of home in one city and transplanting it into another whilst deliberately removing some of the more homely elements of BasementArtsProject in favour of an exhibition that sets out to depict punishment and the nature of degradation though a hostile environment. 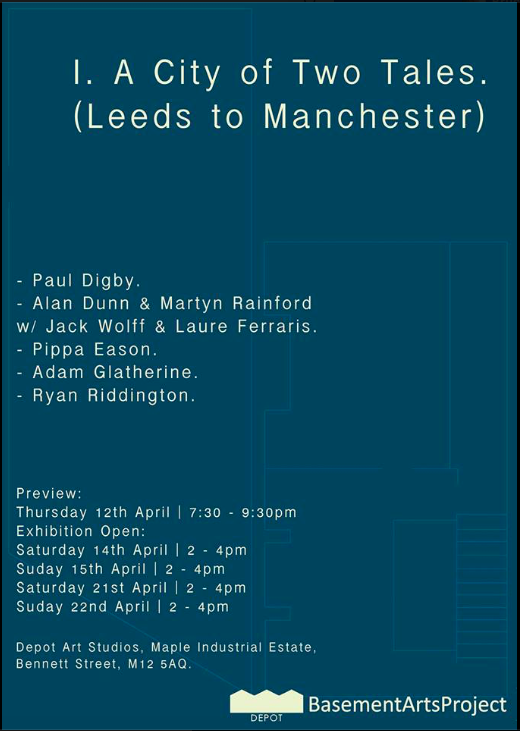 It will be interesting to see the direction that May’s exhibition will take when we introduce the work of the five Manchester artists. 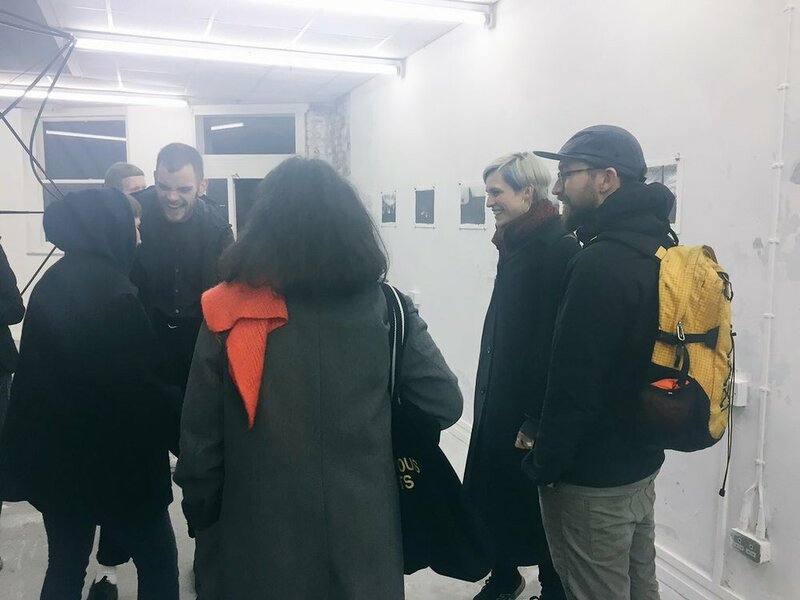 For every exhibition at BasementArtsProject we have a Lunchtime Conversation event in which people are invited to share a meal and chat with the artist. As much tea and coffee as you want . . . . .